Objectives We aimed to describe the rate and determinants of carotid plaque progression and the onset of clinical cardiovascular disease (CVD) in a UK SLE cohort. Methods Female patients with SLE of white British ancestry were recruited from clinics in the North-West of England and had a baseline clinical and CVD risk assessment including measurement of carotid intima–media thickness (CIMT) and plaque using B-mode Doppler ultrasound. Patients were followed up (>3.5 years after baseline visit) and had a repeat carotid Doppler to assess progression of plaque and CIMT. Clinical CVD events between visits were also noted. Results Of 200 patients with a baseline scan, 124 (62%) patients had a second assessment at a median (IQR) of 5.8 (5.2–6.3) years follow-up. New plaque developed in 32 (26%) (4.5% per annum) patients and plaque progression was observed in 52 (41%) patients. Factors associated with plaque progression were older age (OR 1.13; 95% CI 1.06 to 1.20), anticardiolipin (OR 3.36; 1.27 to 10.40) and anti-Ro (OR 0.31; 0.11 to 0.86) antibodies. CVD events occurred in 7.2% over 5.8 years compared with 1.0% predicted using the Framingham risk score (p<0.001). Higher triglycerides (OR 3.6; 1.23 to 10.56), cyclophosphamide exposure ‘ever’ (OR 16.7; 1.46 to 63.5) and baseline Systemic Lupus International Collaborating Clinics damage index score (OR 9.62; 1.46 to 123) independently predicted future CVD events. Conclusion Accelerated atherosclerosis remains a major challenge in SLE disease management. A more comprehensive approach to CVD risk management taking into account disease factors such as severity and anticardiolipin antibody status may be necessary to improve CVD outcomes in this high-risk population. The impact of accelerated atherosclerosis on morbidity and mortality in SLE has been well documented over the past four decades.1 2 Many questions remain unanswered, particularly relating to risk stratification and factors influencing the initiation and progression of atherosclerosis. While it is clear that traditional cardiovascular disease (CVD) risk factors play an important role,3 several studies have demonstrated that disease-specific factors are also important and as a result, traditional risk prediction models perform poorly in SLE.4 The exact contribution of inflammatory burden, renal disease and a procoagulant state in the context of long-term corticosteroid and immunosuppressant therapy can be difficult to evaluate. Studying clinical complications alone requires large long-term studies and therefore only a few studies have attempted to study predictors of actual atherosclerotic events in SLE.3 5–7 Several modalities have been used to measure subclinical atherosclerosis in SLE and approximately 30%–40% of patients have evidence of subclinical lesions by a range of methods.8–10 High-resolution B-mode Doppler ultrasound has been widely used to measure both carotid intima–media thickness (CIMT) and carotid plaque. Large general population studies have used CIMT and found an association with classic cardiovascular risk factors such as hypertension, hyperlipidaemia and family history of coronary heart disease (CHD)11–13 and also demonstrated CIMT to be an independent predictor of CHD.14 15 Within SLE, we and others have found carotid plaque in 29%–37% of patients compared with 15%–22% of controls.16 The excess of carotid plaque in SLE is particularly striking in those under 55 years old.16 17 There are only a few follow-up studies in patients with SLE, but these have shown progression of carotid plaque, which in turn predicted future CVD events.18 19 Factors that have been associated with plaque progression in SLE included homocysteine, higher C3 complement and immunosuppressive use.18 19 The aim of this study was to describe the rate and determinants of carotid atherosclerosis progression and the development of clinical CVD events in a UK SLE cohort. Our baseline cohort was assembled between 2002 and 2005 as previously described.16 This cohort was re-contacted and invited back for a further assessment at a minimum of 3.5 years after their baseline visit. We made several attempts to contact patients no longer under follow-up in their original clinic and/or who have moved address during the interim period. For those who died, we noted the cause of death from their clinic records and/or after discussion with their primary treating physician. The cohort consisted of female patients of white British ancestry16 who were at least 18 years old and fulfilled four or more 1997 American College of Rheumatology (ACR) criteria for SLE.20 Patients who fulfilled three criteria for SLE in the absence of any alternative diagnosis were also included, as previously described.16 All patients gave written informed consent and the study was approved by the Central Manchester Local Research Ethics Committee. Carotid examinations were undertaken by one of two vascular technicians on the day of the clinical assessments, one of whom had performed the original scans but both were blinded to the baseline carotid examination results at time of the follow-up scan. CIMT and plaque were quantified as previously described.16 Briefly, the right and left common carotid artery (CCA), carotid bulb and the first 1.5 cm of the internal and external carotid arteries were examined in longitudinal and cross-sectional planes using the Philips HDI 5000. Intima–media thickness (IMT) was measured as previously described and validated.25 Measurements were made at the time of scanning, in a longitudinal plane at a point of maximum thickness on the far wall of the CCA along a 1 cm section of the artery proximal to the carotid bulb. Measurements were repeated three times on each side, unfreezing the image on each occasion and relocating the maximal IMT, and the average of six measurements were then used to calculate the mean IMT. Carotid plaque was defined if two of the following three conditions were met: (1) a distinct area of protrusion >50% compared with the surrounding area into the vessel lumen, (2) increased echogenicity than the adjacent boundaries and (3) IMT >0.15 cm 26 . Plaque burden was estimated using the plaque index, a summary score of number and size of plaque as previously described.25 A good level of agreement was observed between technicians (mean difference −0.001, 95% limits of agreement −0.0098 to 0.0078). All data were analysed using STATA V.13.1 statistical software. Comparisons were made by means of a two-sample t-test for normally distributed continuous variables and by χ2 analysis for categorical variables. For non-normally distributed variables, non-parametric tests were determined using Kruskal-Wallis rank test for categorical variables and Spearman’s correlation coefficients for continuous variables. Two-sided p values of less than 0.05 were considered to be significant. Age-adjusted linear and logistic regression analyses were used to determine the association between baseline risk factors and progression in CIMT, carotid plaque and incident clinical cardiovascular events. Standardised coefficients were used to assess the strength of associations between variables. A backward stepwise multivariable model which included baseline age, follow-up period and variables that had a significant relationship in the univariate analysis or could logically be a confounder was performed with a threshold for significance at p value <0.2 to assess the best models to predict plaque progression (defined as increase in plaque index including those with no plaque at baseline who developed plaque), CIMT progression and clinical CVD events. Two hundred patients were assessed at baseline and 124 (62%) were contactable and agreed to return for assessment at a second timepoint. The median (IQR) time between visits for these 124 patients was 5.8 (5.2–6.3) years. The median (IQR) baseline age and disease duration was 49 (44–56) and 11 (4–18) years, respectively. Baseline clinical and serological features of those followed or lost to follow-up are summarised in table 2.16 Seventy-six (38%) of the baseline cohort did not participate in the follow-up study. Forty-five (23%) patients had a change of address or could not be contacted; 21 (10.5%) declined further participation and of these, one had developed throat cancer, one had bladder cancer and another had a stroke; the others declined for social reasons (caring for relatives, child care and employment). Ten patients (5%) died during the follow-up period; causes of death included malignancy (four in total; cervical, intracerebral, lung and liver), ruptured aortic aneurysm (n=1), cerebral haemorrhage (n=1) and gastrointestinal haemorrhage (n=1). The cause of death was unknown in three patients. Apart from higher triglycerides and lower systolic blood pressure at baseline, those who did not return did not differ significantly with respect to SLE features, therapy exposures or classic CVD risk factors to those who had a return visit (table 1). Table 3 summarises changes in carotid plaque and CIMT over time. At baseline, 34/124 (27%) patients had at least one carotid plaque and by follow-up, 63/124 (50%) patients had at least one plaque. The change in carotid plaque status is summarised in figure 1. Almost half of patients (59/124; 47.6%) had no plaque at either time point. Thirty-two patients (26%) free of plaque at baseline developed a new plaque at the second assessment. Of those with plaque at baseline, 20 (17.5%) had an increased plaque index, 9 (7%) patients had a stable plaque index over time and 4 (3.2%) had a lower plaque index at the follow-up assessment. 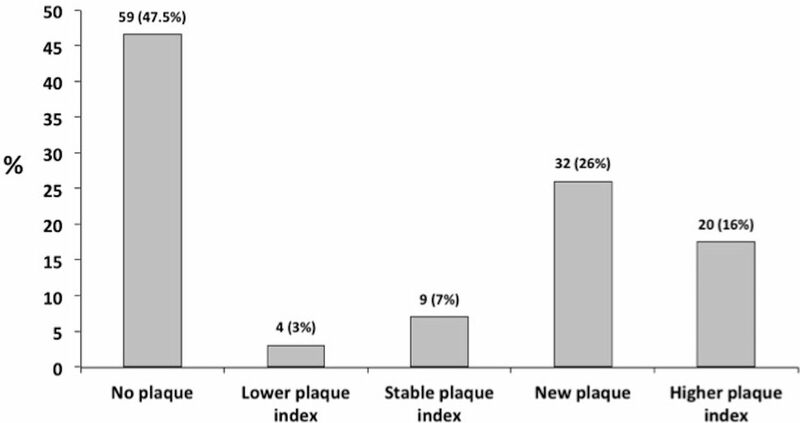 Fifty-two (41%) patients had evidence of plaque progression, defined as either new plaque or increase in plaque index. Summary of plaque at follow-up. CIMT overall showed progression between visits (table 3); however, we noted that eight (7%) patients had regression of CIMT at follow-up. In univariable analysis, baseline age was associated with both plaque and CIMT progression and therefore all analyses were adjusted for age and disease duration. Factors associated with plaque progression are summarised in table 4. The percentage of 5-year cardiovascular risk at baseline was significantly associated with plaque progression even after adjustment for disease duration (OR 1.51; 95% CI 1.11 to 2.05). Of note, positive Ro and La antibodies were both negatively associated with plaque progression (OR 0.27; 0.10 to 0.75 and OR 0.31; 0.11 to 0.86, respectively). In contrast, anticardiolipin (aCL) antibody status was associated with an increased risk of plaque progression (OR 3.64; 1.27 to 10.40). In a multivariable analysis, a positive aCL remained independently associated with plaque progression (OR 3.14; 1.10 to 9.01), and this was robust when we retained classic risk factors in the model (OR 3.57; 1.23 to 10.56). In a multivariable analysis, lower systolic blood pressure, lower triglycerides and metabolic syndrome all remained independently associated with CIMT progression (table 5). Twelve (9.7%) patients had 13 CVD events between visits (one patient had both a cerebral and coronary event) (table 6). Of the 12 (9.7%) patients with known clinical CVD at baseline, 4 (33%) had a further event. In those free of CVD at baseline (n=112), the new event rate was 7.2% (eight patients) over 5.8 years. In contrast, the median predicted 5-year percentage risk for this cohort was 1 (1–3)% (p<0.001). The median (IQR) 5-year percentage risk tended to be higher in those with a future CVD event (2.5 (1.5–5)% vs 1 (1–3)%, p=0.12). In an age-adjusted univariable analysis (table 4), a number of classic risk factors and SLE-related factors were associated with future CVD events. Neither presence of carotid plaque nor CIMT at baseline predicted future events (date on file). In a multivariable analysis, higher triglycerides (OR 3.61; 1.23 to 10.56), cyclophosphamide exposure ‘ever’ (OR 16.7; 1.46 to 63.5) and the SDI score (OR 9.62; 1.46 to 123) independently predicted CVD events (table 7). When we removed the CVD descriptors from the SDI, it remained in the model (OR 9.89; 1.51 to 64.4). In this longitudinal study of white British women with SLE, we found over a median 5.8 years of follow-up, 26% developed new carotid plaque and carotid plaque progressed overall in 41%. In addition, 7.2% of those free of CVD at baseline had a new CVD event in this period, a sevenfold higher rate than predicted by the Framingham model. Our data accord with the Hopkins Cohort study in which new carotid plaque was observed in 26% of patients, and at the second assessment, a higher plaque index was observed in another 17.5%.27 In a general population-based study of women aged 59–71 years, carotid plaque progressed in 18% over 4 years.28 Therefore, our findings and those of Kiani et al suggest that carotid plaque progresses at a higher rate in patients with SLE than would be expected.27 Our overall carotid plaque progression rate (4.5% per annum) is in agreement with that estimated by Thompson et al in Pittsburgh (6.5% per annum). In addition, like us, Thompson et al noted only minimal plaque regression (5%).29 As expected, age is a key determinant of new plaque development. Interestingly, we found that of SLE features, anti-Ro antibody was associated with reduced risk of new plaque and aCL antibodies were associated with greater plaque progression. The association with aCL antibodies remained significant in both a multivariable model and in a model including classical risk factors. We defined aCL antibodies as the presence of two positive results at a moderate to high titre at any time during the disease duration. Our previous study had found a cross-sectional association between aCL and prevalent plaque.16 Our current results suggest this association was with atherogenesis and may reflect the presence of cross-reacting epitopes with our clinical assay that are pro-atherogenic. Previous work has suggested that certain autoantibody subtypes such as anti-HDL or anti-oxLDL antibodies may be associated with aCL and be in themselves atherogenic.30 Ro-positive patients may represent a phenotypic subset with a lower risk of atherosclerosis, although the precise mechanism(s) underlying this cannot be ascertained from this study. The mean change in CIMT in our cohort (0.002 cm/year) is in the range reported in other SLE studies (0.0012–0.0039 cm/year).31–33 This is approximately double the rate previously reported in the general population.34 In contrast, a recent controlled study has suggested that CIMT progression in SLE is no greater than a control population.32 In the current study, univariable factors associated with CIMT change were total cholesterol, the metabolic syndrome, SDI and C4 levels. Paradoxically, SDI was negatively correlated with CIMT progression suggesting a higher SDI correlates with less IMT progression. This may be an artefact due to the small sample size of the study, given the wide CIs observed. Another possible explanation is a surviving cohort effect, that is, those with higher rates of damage accrual have left the cohort at baseline. While the baseline SDI was comparable in those who were and were not followed, we were unable to assess if those who were lost to follow-up accrued further damage after their baseline assessment (although we do know that in this group at least six developed a new cancer and two had major cardiovascular events). Similarly, in the multivariable analysis, triglyceride level, systolic blood pressure and fasting glucose were negatively correlated with CIMT progression. Again, sample size or a surviving cohort effect may explain these apparently paradoxical results. Our study also adds to the observations of others that clinical CVD events occur at a higher rate in SLE that is predicted by usual risk estimate equations. In this study, there was a sevenfold higher rate of cardiovascular events than predicted. In addition, the only traditional risk factor which significantly predicted events was triglyceride levels. Esdaile et al previously noted a sevenfold higher than predicted rate of events in a cohort of patients with SLE4 and Bessant et al also noted that while the mean 10-year percentage risk of coronary events in their cohort was 1.4 (0.2–3.4)%, over follow-up, 8.5% actually had a coronary event.35 With regard to risk factors for clinical events, in a longitudinal analysis of the Toronto cohort, age and triglyceride levels were the only significant predictors of future CVD events. This emphasises the need for better risk stratification models in patients with SLE. With regard to SLE-related factors, our study was underpowered to assess a range of factors. Cyclophosphamide exposure was a strong predictor of cardiovascular events at follow-up and remained in the multivariable model. While this association could reflect unmeasured confounders such as disease severity and cumulative steroid burden, the small number of patients on cyclophosphamide and wide CIs do mean this result should be interpreted with caution. However, the association between higher SDI and future CVD events both in this study and in a previous case–control study in the UK may support this hypothesis.3 A higher SDI is likely to reflect the cumulative burden of chronic inflammation36 and steroid exposure37 or alternatively, patients prone to damage in one organ system may also be more prone to atherosclerotic damage.38 Further studies investigating these associations are therefore warranted. It is interesting to note that neither CIMT nor the presence of plaque at baseline were associated with CVD events at follow-up and that different baseline factors predicted subclinical and clinical outcomes. Both CIMT and carotid plaque have been shown to be predictors of long-term cardiovascular mortality in large population studies. Kao et al undertook the only published study, which has evaluated the association between baseline CIMT and plaque with future CV events in SLE.19 In this study of 392 female patients with SLE (median follow-up 7.9 years), a borderline association between CIMT, plaque presence and incident CV events was observed (OR (95% CI) 1.14 (1.00 to 1.31) and 1.83 (0.91 to 3.66) for baseline CIMT and plaque, respectively). When only ‘hard’ CV events were considered (angina or TIA excluded), the association became statistically significant. This study had a larger sample and followed for longer than the current study. Thus, it is likely that we were underpowered to detect the association between subclinical disease and subsequent clinical events. There is also some debate about which measure of plaque progression to use in longitudinal analyses. It should be noted that risk factors for the initiation of atherosclerosis may be different to those for disease progression or severity. In this regard, the most appropriate comparison groups may be those with no plaque versus those with new plaque over time. To obtain meaningful results, long-term follow-up of a large cohort of patients is required. The differences observed in this study with regard to CIMT may also reflect the differences in measurement as some previous studies have limited measurement to one part of the carotid artery.31 Additionally, unlike previous studies, the current study was limited to white British women, as the original cohort was set up to study genetic factors. This is a limitation of the current study and there is a need to conduct further CVD outcome studies in non-Caucasian populations. A number of other limitations need to be considered when interpreting these findings. The sample size in the current study of 124 patients is relatively small and while the average follow-up period of more than 5 years is longer than in previously reported studies, this is still a relatively short period of follow-up. The limitations of sample size and duration of follow-up in this study may have influenced the ability to detect a correlation between clinical events and subclinical measures. Furthermore, the clinical events were patient reported, which is a weakness. We also acknowledge that our follow-up cohort only included 62% of our original group. We made every reasonable effort to contact all patients; however, a number were truly lost to follow-up, which may be inevitable in a mobile urban population. In addition, another large group declined to return for study, mainly due to changing of their personal circumstances. There is of course the potential for bias being introduced. When examining differences in baseline characteristics of those followed or lost to follow-up, lower serum triglyceride levels and higher systolic blood pressure were noted in those who were followed up. All other CVD risk factors and disease characteristics were similar between the groups. Those lost to follow-up did not have any consistent markers of a differential level of disease severity or CVD risk. However, if those lost to follow-up had more severe disease, it would, if anything, tend to bias us towards a conservative estimate of clinical and subclinical disease progression. Whether or not this is the case, the factors we identified as significant predictors will maintain validity within this cohort and since our power will be limited by the smaller follow-up group, significant results remain of relevance. However, we acknowledge that several important factors (eg, antimalarial use) may have been identified or confirmed, due to limited power. Longitudinal studies provide the opportunity to determine factors that will help us improve risk stratification of SLE populations for future CVD events and the identification of potentially modifiable risk factors. Our results suggest that a more comprehensive approach to risk stratification is needed as well as classic risk factors, for example, triglycerides which are less often a target for intervention also contribute to future CVD events in SLE. A higher-risk population may also be identified from patients who require potent immunosuppression as well as those with anticardiolipin antibodies. Such factors may be a useful adjunct to routine CVD screening approaches and may result in improved CVD risk in this high-risk population. We thank the Arthritis Research UK for their support: Arthritis Research UK grant number 20380.
. Morbidity in systemic lupus erythematosus. J Rheumatol Suppl 1987;14(Suppl 13):223–6.
. Single photon emission computed tomography dual isotope myocardial perfusion imaging in women with systemic lupus erythematosus. I. Prevalence and distribution of abnormalities. J Rheumatol 2000;27:2372–7.
. Predictors of carotid atherosclerosis in systemic lupus erythematosus. J Rheumatol 2006;33:2458–63.
. Derivation of the SLEDAI. A disease activity index for lupus patients. The Committee on Prognosis Studies in SLE. Arthritis Rheum 1992;35:630–40.
. Common carotid intima–media thickness predicts occurrence of carotid atherosclerotic plaques: longitudinal results from the Aging Vascular Study (EVA) study. Arterioscler Thromb Vasc Biol 2000;20:1622–9.
. Effect of antimalarial agents on the fasting lipid profile in systemic lupus erythematosus. J Rheumatol 2000;27:2142–5.
. Accrual of organ damage over time in patients with systemic lupus erythematosus. J Rheumatol 2003;30:1955–9. Contributors INB, MYA and SH conceived of study design. INB, SH, MYA, YA, HE, PH, RG and CR were involved in data collection. SH, INB and SS performed analysis of results. All authors contributed to manuscript preparation. Funding INB is a National Institute for Health Research (NIHR) Senior Investigator and is funded by the NIHR Manchester Biomedical Research Centre and the NIHR Manchester Wellcome Trust Clinical Research Facility. INB also acknowledges support from Arthritis Research UK and The Manchester Academic Health Science Centre. This study was hosted by the NIHR/Wellcome Trust Manchester Clinical Research Facility. SH was supported by an Arthritis Research UK Clinical Research Fellowship (grant no. 17574). SS received funding from the North West England Medical Research Council Fellowship Scheme in Clinical Pharmacology and Therapeutics, which is funded by the Medical Research Council (grant no. G1000417/94909), ICON, GlaxoSmithKline, AstraZeneca and the Medical Evaluation Unit. Ethics approval Central Manchester Local Research Ethics Committee.